from determination of training needs to transfer of learning the workplace. In a cluttered market of providers, Internet platforms and freelancers, it is difficult to separate the wheat from the chaff. Simple means are used to design web pages and create references to convey the impression of size and competence. 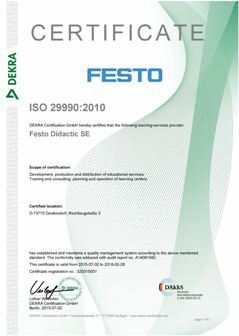 Festo Didactic underscores its standing as one of the world's leading training providers with certification according to DIN ISO 29990:2010, the standard for quality management of educational institutions. As a training and education provider you can trust to develop the competences of your company’s most important asset – your employees. We contribute to the skill development of your staff and your productivity. Meet us at the major educational and industrial fairs, at one of our information events, or arrange a personal appointment. Discover our entire range of topics and get in touch with our local representatives.